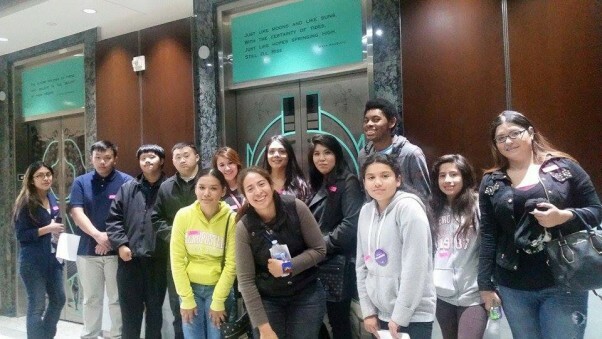 A group of 13 Merced youth, ranging from ages 12 to 24, visited the State Capitol in a trip set up by the Merced Organizing Project. Their mission was to bring attention to issues plaguing young communities, like obstacles to education and health care, and the threat of violence. One of the cohort’s goals was to put pressure on political leaders to pay attention to younger residents’ needs – Merced has a significant population under 25. “We need to remind them that we exist. It’s not like we are just there, not caring about our community. We do care!” Read more on We’Ced. This entry was posted on April 23, 2015 by Editor in Print, WeCed and tagged Advocate!, gun violence, Healthcare, Politics, Safety, School, youth leadership.